On 23 September, Cardinal Vincent spoke to the media to outline some of the themes which he sees will be prominent at the forthcoming Synod on the Family. The Cardinal will take a direct part in the proceedings of the Synod as President of the Bishops' Conference. Placing the October Synod into context, he referred to the various stages of this process, beginning with the questionnaire last year which aimed to find out how Catholics understood the Sacrament of Marriage, the discussions which took place at the Consistory in Feburary where he was admitted to the College of Cardinals, the forthcoming Extraordinary Synod, the Ordinary Synod in 2015, and culminating with the likely publication of a document to explain the Church's teaching. 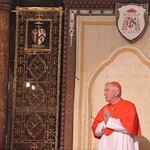 The Cardinal then outlined the themes which he has seen emerging so far in the process, beginning with the return of the emphasis on the gift of God's mercy, which he spoke about as 'a return to that lived sense of the compassion and mercy of God' which balances God's mercy with the necessary response of forgiveness and conversion. Cardinal Vincent went to speak about marriage as the basis for the family and that whatever support the Church offers to families should 'rightly take its shape around the children' and that the Church should work in partnership with the parents of these children. He went on to speak about the need for marriage preparation for couples which should develop in them an understanding of marriage as a sacrament. He also spoke about the family as a witness to society. The Cardinal also invited everyone to join Pope Francis in a day of prayer for the Synod on 28 September, and invoking the blessing of the two patron saints of the Synod: Pope St John XXIII, as the 'guided guide' who as guide of the Church was himself guided by the Holy Spirit, and Pope St John Paul II, as the Pope and teacher of the family. The Cardinal's full remarks at the press conference can be accessed here. The Cardinal's responses to media questions can be viewed here.